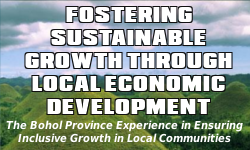 The Provincial Development Investment Program (PDIP) is a six-year planning document that ranks and prioritizes programs, projects and activities (PPAs) proposed in the Provincial Development and Physical Framework Plan (PDPFP) and matches the prioritized project list with the investment schedule and financing plan in which the investment requirements of the proposed projects balances the funding capability of the province, on an annual bases, during the multi-year period covered by the PDIP. The current year slice of the PDIP is the Annual Investment Program (AIP) which constitutes the indicative expenditure requirements of the province’s PPAs to be integrated into the current annual budget. You may download the PDIP and the AIPs from the links below.